During his 50 years of psychical research, Sir William Fletcher Barrett (February 10, 1884 - May 26, 1925) observed many types of phenomena. In his reminiscences, read at a private meeting of the Society for Psychical Research (SPR) on June 17, 1924, less than a year before his death, Barrett said: "I am personally convinced that the evidence we have published decidedly demonstrates (1) the existence of a spiritual world, (2) survival after death, and (3) of occasional communication from those who have passed over... It is however hardly possible to convey to others who have not had a similar experience an adequate idea of the strength and cumulative force of the evidence that has compelled [my] belief." Barrett was the prime-mover in the founding of the SPR in 1882, serving as vice-president and editor of the Society's Journal during its first year and president in 1904. He also encouraged Professor William James of Harvard to organize the American branch of the SPR in 1884. 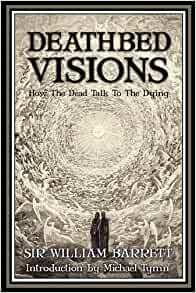 In this book, Deathbed Visions, first published in 1926, the year after his death, Barrett reported on a number of intriguing cases in which a dying person appears to see and recognize some deceased relative or friend, some of them involving instances where the dying person was unaware of the previous death of the spirit form he saw. "These cases form, perhaps, one of the most cogent arguments for survival after death, as the evidential value and veridical (truth telling) character of these visions of the dying is greatly enhanced when the fact is undeniably established that the dying person was wholly ignorant of the decease of the person he or she so vividly sees," Barrett stated in the book, now something of a classic in the field. 5.0 out of 5 starsA content-packed foundation for people interested in the modern NDE subject. Sir William Barrett gives a great introduction into the early exploration into non-material phenomena. This short book starts with, well, visions of the dying, but in subsequent chapters covers myriad variations and even goes into the implications of thought transference. One thing that makes it a little bit of a tough read is the inclusion of the names of everyone in each of the dozens upon dozens of accounts. The names aren't really important as these accounts are 150+ years old, but given the time that this was written it's understandable to want to give credit to the people Sir Barrett acquired these accounts from. But it makes some accounts hard to follow when you combine all the names with early 20th century/19th century English. If you are interested in the subject matter you won't be disappointed at this pioneering work that helped lay the foundation for modern day NDE research and the like. I recently went to The Art of Dying conference, sponsored by the Open Center in New York City. This book was recommended by one of the speakers. The book is filled with fascinating, well-documented stories. It confirms my belief in survival after death and should confound skeptics. Excellent reading and highly interesting. Very dated but then again, on this subject, the years do not matter. Very interesting since it was of older stories in 1800's. Much of this book was very enjoyable. When I bought that book, I was sort of building a case for the reality of the spirit world. I had been reading Near Death Experiences and I had been converted from a person who did not believe in a personal afterlife (while believing strongly in God, or a supreme creator etc) to a person to whom an afterlife seemed pretty likely. I was reading more and more NDEs, including editing them for clarity to make them more easy to absorb directly into the mind!! I was immersed day in day out in the ideas and images I was ingesting. So I started ordering books, too, and I read about mediums and channelers. And then I found THIS book. The "active" parts, the "Deathbed Visions" were ones people had around the turn of the century, that is, the 20th century. The descriptions and the language was quaint, delicate, and emotional. The veil between the "worlds" seemed to have breezes moving through it, with each new scene. What most people will say when they talk about the paranormal movement at that time, is that people who were dying were not being given such heavy drugs to ease the pain that often accompanies the dying phase of the diseases we died from then. And people were often in and out of consciousness, and someone was often sitting by the bedside of the dying person—either a nurse or caretaker, or a loved-one. It was much more common to watch a dying person suddenly focus on a far corner of the room and greet a family member who had gone on before them. They would hold out their arms, their eyes lit up with love, while the exclaimed the departed loved one's name. And sometimes they could be seen greeting others that had joined the departed one. It would become clear that the person was being told they would soon be leaving this earth and they were to feel joyful and safe while accompanied by long-missed mothers, fathers, aunts, or whatever—even children, who had died young. At times only one bedside sitter for the dying person would see a spirit while no one else would be able to. Some would hear unearthly music, or see beautiful colors. Sometimes a apparition of an angel could be seen, or family members would seize the arms of the dying person, and only for a moment, spirits from the next world could actually be apparent. There is one story I remember in which people outside the building were able to hear unearthly music, and see light emanating from the building during the crossing. Well, I found this combination of what I am interpreting as cold hard facts! of dying people having visions of loved ones or angels coming to get them, told with Victorian grace and delicacy just charming. I read it a couple of years ago, but the aura of it stays with me still. Also, there were facts of a harder nature. Those I don't remember as well. And I seem to recall that there were parts of the book that I didn't find all that readable. I would love to read more deathbed visions! Raymond Moody has written about entire families traveling along with the dying patient from the hospital room, keeping him company on his last journey from earth! But, as I said, so many people die, their consciousness dulled by painkillers etc, that maybe that dying person witnesses being greeted, but no one else does. If what I've written interests you, why not pick up precious this little book!! Then recommend it to all the rest of our crowd, which is growing by leaps and bounds, if I'm not mistaken! !